The Sierra Club has a history of involvement in housing issues. We have long-standing policies that strongly support infill projects, reducing pollution, and preserving the natural environment in relation to housing development. We also support affordable housing as a matter of social justice. This aspect of California's affordable housing crisis was summed up in the March 25 New York Times by California state Sen. Scott Wiener (D-San Francisco) and Dr. Daniel Kammen, professor of energy at UC Berkeley: "By making housing shockingly expensive near jobs and transit, cities force low-income and working-class people to live far away from where they work. Our communities lose their economic diversity, while the abundant opportunities, services, and neighborhood amenities of cities are walled off to all but the very wealthy." BY THE NUMBERS James Hansen, former NASA scientist and an author of “Global Temperature in 2017,” shared this up-to-date global temperature graph showing an upward trend in surface temperature of the Earth. That's a good backdrop against which to view San Luis Obispo County 4th District Supervisor Lynn Compton's notorious preferred solution to the crisis: Young people should study the most potentially lucrative subjects in college so they can get jobs that will make them rich enough to afford a home. It's also an appropriate backdrop for the recent "landmark" deal on affordable housing brokered by the county Board of Supervisors, which effected a compromise that threw in the towel on the county's longstanding goal of ramping up to a requirement that all residential development projects include 20 percent affordable units. The county's compromise deal set the bar at "a fixed 8 percent requirement." The city of SLO appears to be in the grips of the notion that the city can build its way out of the affordable housing crisis by issuing permits to all comers, along with waivers from the general plan and established environmental requirements for orderly development, without much pondering of just how a rapidly increasing supply of $600,000-and-up, three-bedroom, single-family homes is going to solve a crisis of affordability. How do these outcomes square with workforce housing pilot programs and affordable housing incentives at the county and the city, and how can those outcomes be improved? To help answer that question, the Sierra Club is hosting a town hall on affordable housing on May 15 at the Copeland Pavilion at French Medical Center. It's open to all. The Copeland Pavilion is at 1823 Johnson Ave., third floor. There's parking in the back. The meeting starts at 7 p.m.
Postscript: Recently, in this space ("A Terrible Deal," March 14), Al Fonzi tried to defend a core belief in the mythology of climate change denial, writing that "there's been virtually no measurable or statistically relevant warming of the climate for nearly the last 20 years (since 1998), and the climate models that are predicting an overheated planet didn't foresee this and can't explain it." In support of this claim, Mr. Fonzi sought to enlist former NASA scientist James Hansen, who was "reported to have stated 'that nature may conspire [over] the next 10 years to produce the impression of an ongoing pause in global warming.'" Hansen's actual quote, from the paper "Global Temperature in 2017," reads thusly: "Because of the combination of the strong 2016 El Niño and the phase of the solar cycle, it is plausible, if not likely, that the next 10 years of global temperature change will leave an impression of a 'global warming hiatus.'" In other words, Hansen's quote provided precisely zero support for Fonzi's claim. I asked Dr. Hansen what he thought about Mr. Fonzi's interpretation of his words and received the following response: "He is speaking nonsense. 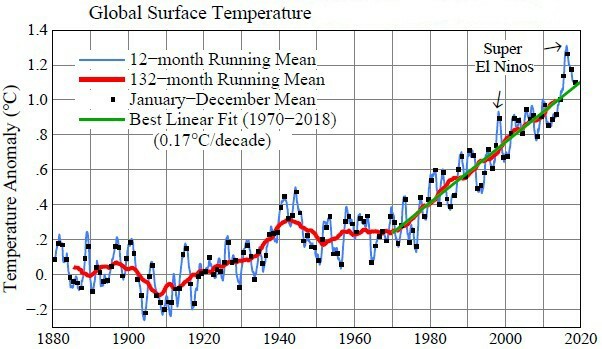 Why don't you send him the up-to-date global temperature graph below and ask where the hiatus or slowdown in warming is."